Sat., 20 Jul. - Mon., 22 Jul. Sun., 19 May - Mon., 3 Jun. Fri., 1 Nov. - Tue., 19 Nov. Sat., 20 Jul. - Fri., 26 Jul. Sat., 12 Oct. - Tue., 15 Oct. Thu., 6 Feb. - Sat., 15 Feb. Sat., 12 Oct. - Mon., 14 Oct. Thu., 26 Sep. - Sun., 29 Sep. Sun., 19 May - Tue., 4 Jun. Sat., 18 May - Tue., 4 Jun. Tue., 30 Jul. - Fri., 9 Aug.
Wed., 19 Jun. - Mon., 24 Jun. Wed., 10 Jul. - Sun., 21 Jul. Wed., 19 Jun. - Tue., 25 Jun. Fri., 13 Sep. - Sun., 22 Sep. Mon., 17 Feb. - Fri., 28 Feb.
See all 1,807 properties in Liberty Intl. This 10-story Newark hotel sits on the grounds of the Newark Liberty International Airport, 15 miles from New York City. A 7-minute complimentary shuttle ride from the Newark Airport, this 349-room hotel is six miles from Jersey Gardens (shopping) and 16 miles from Manhattan. 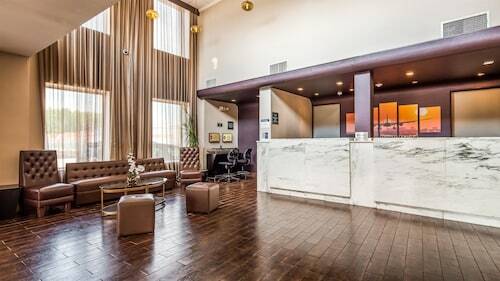 This full-service hotel is located near the Newark Liberty International Airport, 1 mile from downtown Newark, 8 miles from Liberty Science Center, and 14 miles from Manhattan. Situated near the airport, this hotel is within 6 mi (10 km) of Jersey Gardens Outlet Mall, Prudential Center, and Military Park. New Jersey Performing Arts Center and Red Bull Arena are also within 6 mi (10 km). Newark International Airport Station is 14 minutes by foot. Situated near the airport in Elizabeth, this hotel is close to St. Patrick's Church, Jersey Gardens Mall, and Newark Lincoln Park. Area attractions also include City Without Walls. Situated near the airport, this hotel is within 6 mi (10 km) of Prudential Center, Jersey Gardens Outlet Mall, and Military Park. New Jersey Performing Arts Center and Red Bull Arena are also within 6 mi (10 km). Newark International Airport Station is only a 4-minute walk. 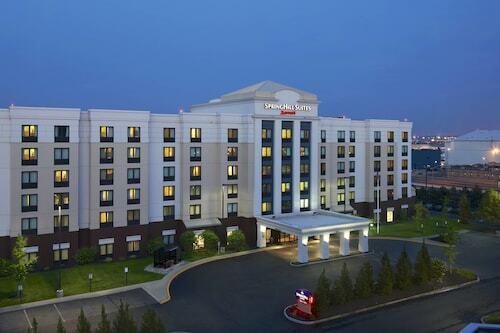 SpringHill Suites Newark Liberty International Airport places travelers a 10-minute drive from the terminals. It’s a 25-minute drive to Manhattan, Times Square, and the ferry to the Statue of Liberty. Prudential Center arena, home to the New Jersey Devils, is an 8-minute cab ride from the hotel. 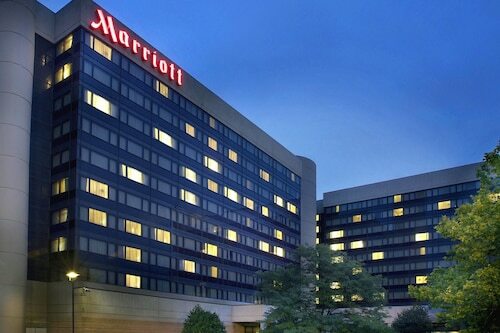 Fronted by spacious lawns and flower beds, this large, tranquil hotel in Newark business district is one-and-a-half miles from Newark International Airport, three miles from downtown Newark and Prudential Center Arena, and 17 miles from Manhattan. Answer : The cheapest day to fly from Halifax to Newark is on Monday. So, if you would like to save a little money on your next holiday look for flights on Monday. Question : Is there an alternative airport near Newark? Answer : Flying into EWR is not the only way to get to Newark. Try searching for flights to LaGuardia Airport (LGA) as well. Over the next two months, flights from YHZ to LGA are 28% cheaper than flights from YHZ to EWR. This airport is17 miles away from EWR. Answer : With six total flight time options, Tuesday provides the most flexibility from YHZ to EWR. The day of the week with the least amount of options is Friday with only five different times. Question : Which airline has the least delays from Halifax to Newark? Answer : Booking with Republic Airlines means you will arrive to Newark pretty close to the time your ticket states. In fact, this airline has a 76% average for getting there on time. Question : How long do most people stay on their visit to Newark? Answer : Of course, you're not most people, but if you were, you'd stay roughly 30 days. Question : How much is a plane ticket to Newark (EWR) from Halifax (YHZ)? Answer : Cost can range from $226 to $1,176, prices for YHZ to EWR do change more than most routes from Canada. The further out you book, the more likely you are to save on your trip. Question : What is the cheapest date to fly to Newark? Answer : May 2nd has bookings (as of Apr 15th) for as little as $226. That comes in 49% below the average price for this route. Saving on flight fares means you'll have more money in your pocket for your trip.